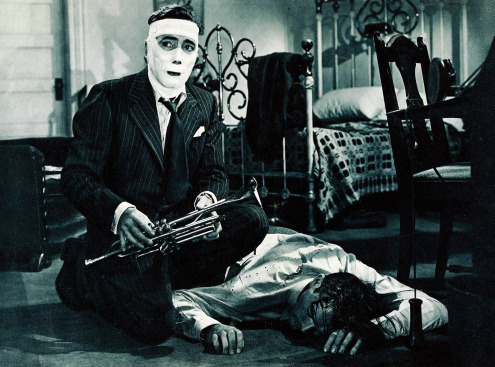 Delmer Daves’s Dark Passage is the red-headed stepchild of the Bogie-Bacall movies. Humphrey Bogart and Lauren Bacall were married in 1945, and stayed married until Bogart’s death in 1957. They made four movies together — To Have and Have Not (1944), The Big Sleep (1946), Dark Passage, and Key Largo (1948). Of these four, Dark Passage is the strangest and the least widely acclaimed. It was a bit of a critical and box office disappointment at the time of its release, possibly because Bogart’s face doesn’t actually appear on-screen until the picture is more than half over, and possibly because of Bogart’s involvement with the Committee for the First Amendment. 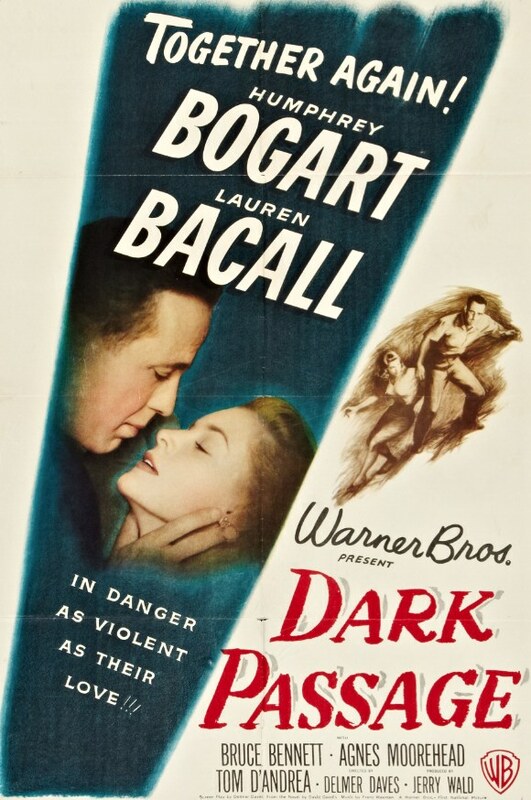 Dark Passage is based on a book by oddball crime novelist David Goodis. 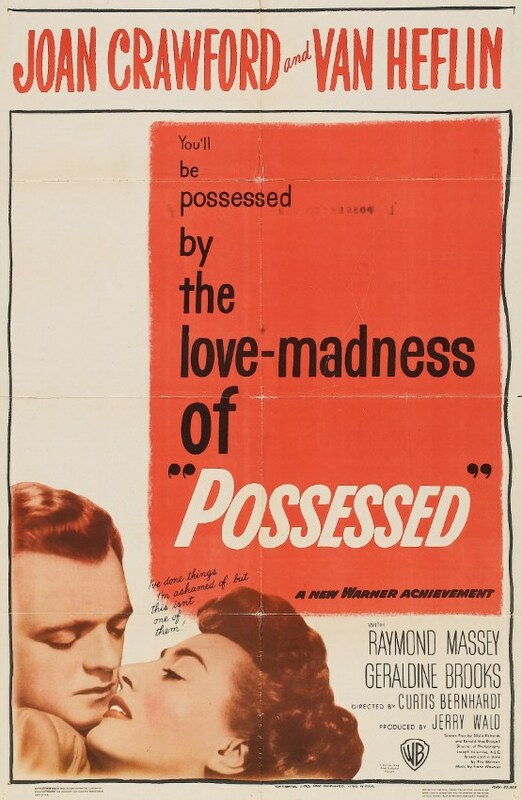 The film does a good job of bringing Goodis’s strong characterizations and nightmarish, occasionally surreal demimonde to the big screen. For better or for worse, it also does a good job of bringing to life some of Goodis’s less powerful aspects, like his convoluted plots and his reliance on coincidence. But just like the best of Goodis’s novels, the film version of Dark Passage doesn’t need to be plausible to work. It plays by its own rules, and when it works, boy does it work. In Dark Passage, Bogart plays Vincent Parry, a man convicted of killing his wife who breaks out of San Quentin by hiding in a 55-gallon drum on the back of a flatbed truck. He manages to roll himself off the truck and into a ditch somewhere in Marin County. He strips down to his undershirt, buries his prison-issue shirt, and takes to the highway to thumb a ride. He’s picked up, first by a guy named Baker (Clifton Young), and then — when that little ride goes sour — by a beautiful artist named Irene Jansen (Lauren Bacall). She hides him under her canvases and wet paint so they can make it through a roadblock at the entrance of the Golden Gate Bridge, then she takes him to her luxurious bachelorette pad in North Beach. Why is she helping him? Because her own father was unjustly imprisoned for a murder he didn’t commit, and because she followed Parry’s trial, even writing letters to the editor protesting his treatment by the press. For the first 37 minutes of Dark Passage, Bogart’s face is never shown, for reasons we’ll get to in a moment. This P.O.V. 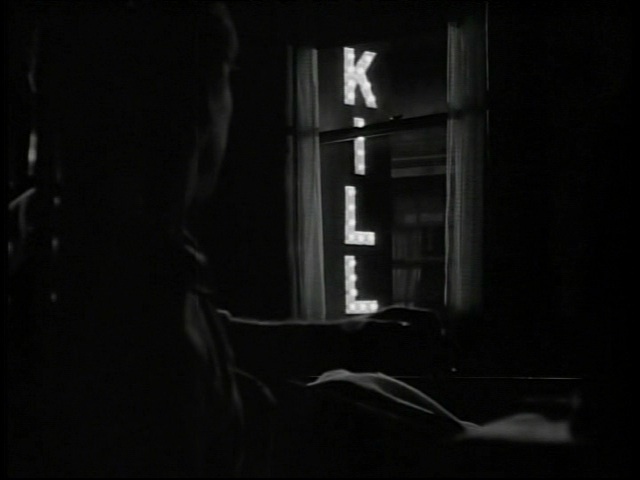 style of filmmaking was pioneered by Robert Montgomery in his film Lady in the Lake (1947), but the technique works much better in Dark Passage, for a variety of reasons. First, the editing is more aggressive than in Lady in the Lake, which was essentially one long tracking shot designed to put the viewer in the shoes of the protagonist but that never quite worked. 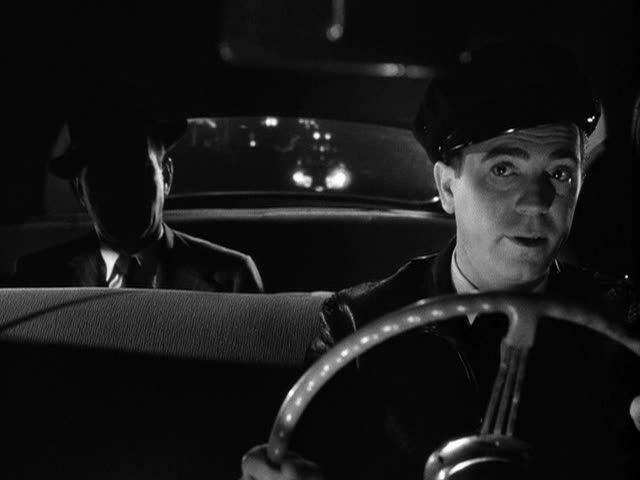 Second, there are third-person shots of Bogart in which his back is turned or his face is in shadows, which helps to break things up and make them more visually palatable. Once Parry makes it to San Francisco, Dark Passage gets really weird. Irene gives him $1,000, new clothes and a hat, and a place to stay, but if you thought that qualified Parry as the luckiest escaped convict in history, you ain’t seen nothing yet. He’s picked up one night by a cabbie named Sam (Tom D’Andrea), who not only recognizes him but believes Parry got a raw deal from the court system, and hooks him up with his buddy, Dr. Walter Coley, a plastic surgeon who can change his face. Nervous about staying with Irene, Parry goes to see his friend George Fellsinger (Rory Mallinson), a trumpet player who gives Parry a key to his place. Incidentally, we get our first shot of Parry’s “real” face on the front of a newspaper laid across his friend George’s chest as he lies in bed. The real Parry has a mustache, and doesn’t look much like Bogart. But he looks exactly like Bogart after his trip to see Dr. Coley, who’s played by 67-year-old actor Houseley Stevenson. Dr. Coley is the most ghoulishly fun character in Dark Passage. Wrinkled, liver-spotted, and chain-smoking, Dr. Coley asks Vincent if he’s ever seen a botched plastic surgery job right before he puts him under, and the kaleidoscopic nightmare Parry has while undergoing plastic surgery is a real standout. Even after the surgery, we don’t fully see Bogart’s face until more than an hour into the picture. Until then, he’s covered with bandages, smoking cigarettes with long filters and communicating with Irene using pencil and paper. 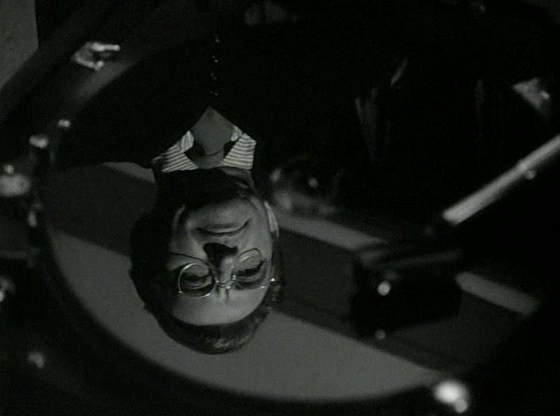 (Throw a pair of shades on him and he’d look like Claude Rains in The Invisible Man). While the plot may be contrived and coincidence-laden, the characterizations are sharp, and the actors are all really good. Lauren Bacall has to carry the film for much of the first hour, and she delivers a really good performance. She’s much better at interacting with the camera than any of the actors in Lady in the Lake were. Consequently, the P.O.V. technique draws less attention to itself, and works fairly well. The fact that Bogart and Bacall were married in real life gives this line a little humorous subtext. 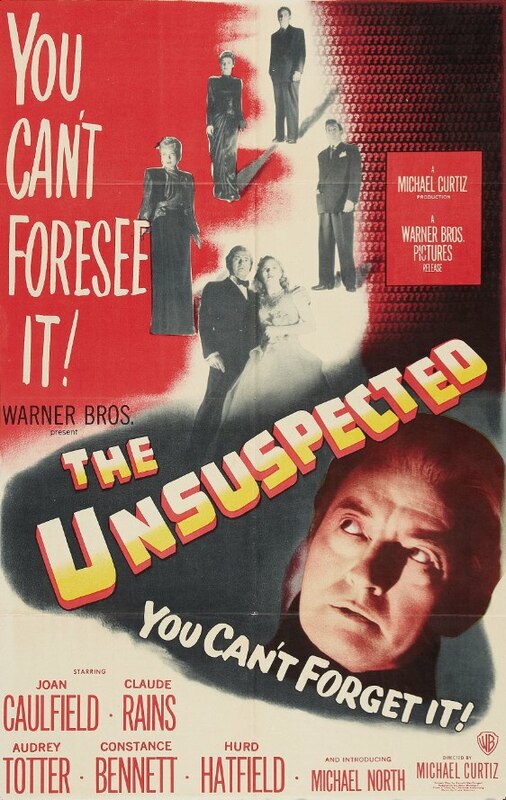 Hidden behind his new face, Parry is faced with another murder to solve, cops on his tail, a chiseler who hopes to blackmail Irene after he finds out she’s been shielding Parry, the presence of Irene’s old beau Bob (Bruce Bennett), and her shrill friend Madge Rapf (Agnes Moorehead), who keeps dropping by and nosing around. That Parry goes about solving his problems in a haphazard, roundabout way should come as a surprise to no one who’s familiar with the fiction of David Goodis. 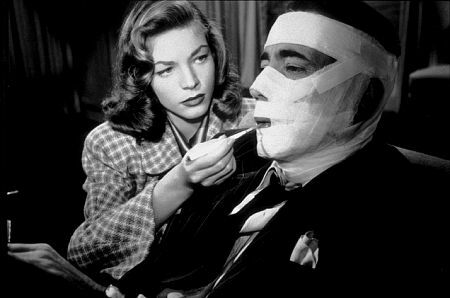 Dark Passage may not be a perfect film, but it’s an intriguing and involving one. Sid Hickox’s cinematography is gorgeous, and the location shooting in San Francisco is really effective. It’s worth seeing at least once, and if you’re like me, you’ll probably want to see it again. Posted in 1947, September 1947 and tagged Agnes Moorehead, David Goodis, Delmer Daves, Film Noir, Houseley Stevenson, Humphrey Bogart, Lauren Bacall, Warner Bros.. Bookmark the permalink. 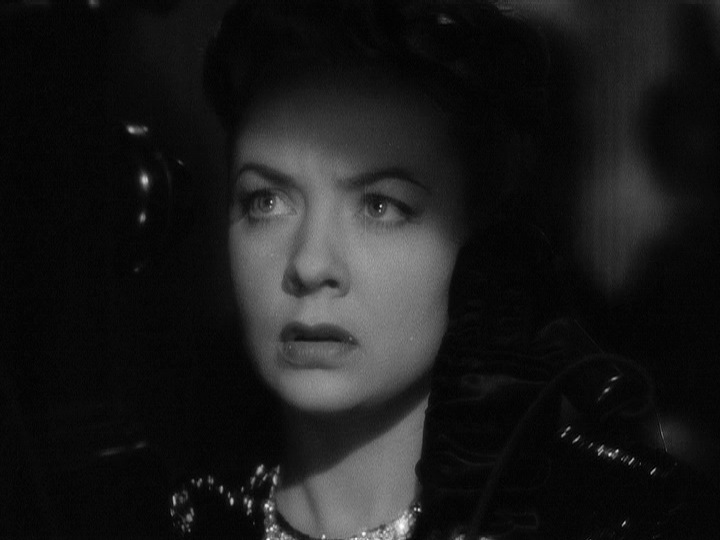 Every student of film noir knows that the genre owes its style to German Expressionism, and to the influx of European directors to the U.S. during World War II. 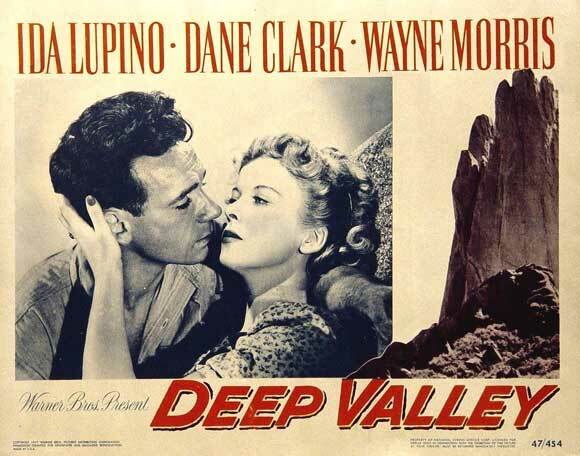 Jean Negulesco’s Deep Valley doesn’t really qualify as a film noir, although it has some hallmarks of the noir style. Instead, it seems as if Negulesco is drawing from an earlier German artistic movement — Sturm und Drang. The high emotions of the film are expressed physically — often through the turbulence of the natural world. Ida Lupino plays a simple country girl named Libby Saul who lives in a broken-down old farmhouse deep in the California wilderness with her parents, Cliff Saul (Henry Hull) and Ellie Saul (Fay Bainter). One night, long ago, Libby’s father beat her mother, and her mother has never forgiven him or spoken to him again. Libby speaks with a stutter, and it is implied that it is directly related to the traumatic memory of seeing her father hit her mother. The rift between Libby’s parents is absolute. Mrs. Saul never leaves her upstairs bedroom, and relies on Libby to wait on her. Mr. Saul never goes upstairs, and roams the ramshackle property in a perpetual foul mood. Libby has no friends, and is isolated from the world. Her father is cruel to her and her mother, who is an invalid by choice, lives in a fantasy world and has never let go of the idea that she is an aristocratic lady. Libby’s only solace is her dog, Joe, and the woods that surround the Sauls’ property. Her only happy moments are when she is roaming the forest with Joe and communicating with nature and wild animals. One day, she discovers a crew of prisoners working on a chain gang along the ocean, excavating and dynamiting the coastline in preparation for a highway. This destruction and remaking of the natural world will bring a steady flow of people past the Sauls’ farm, and radically change Libby’s life. 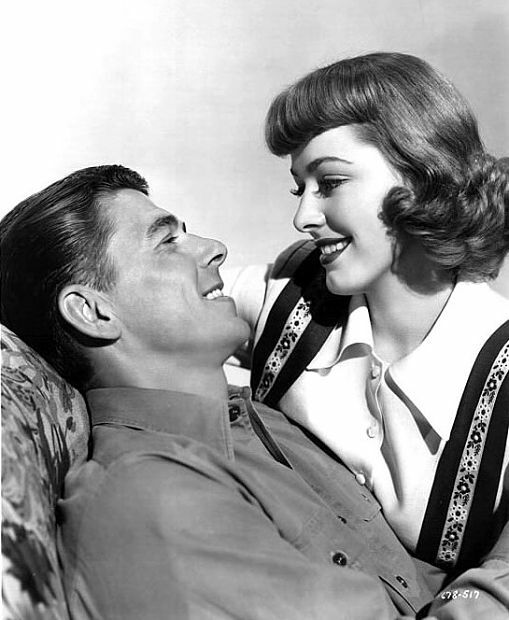 But her life is changed almost immediately when she spots a dark, handsome convict named Barry Burnette (Dane Clark) working on the line. Naturally, fate contrives to bring them together. During a dark and stormy night, a landslide destroys the toolshed in which Barry and a couple of other prisoners are locked up. Libby finds Barry in the woods and helps him stay hidden from the posses that are searching for him, as well as from the good-natured but black-hearted Sheriff Akers (Willard Robertson) and the blandly handsome engineer running the highway project, Jeff Barker (Wayne Morris), who has an eye for Libby. Libby and Barry’s romance begins in an idyllic fashion, but the weight of doom slowly crushes it. It’s not just because he’s an escaped convict. He’s also a violent hothead — never towards Libby or someone who hasn’t provoked him, but when faced with a problem, his first instinct is to lash out and break through, with no thought of what he’ll do next. But Barry is always a likable character. Dane Clark’s performance is soulful and tortured, and his big eyes and open countenance make him sympathetic, even when he’s crouching in the second floor of a barn with a scythe, ready to kill whoever comes up the ladder. We root for Barry and Libby, even though we know their love is impossible. As the film progresses, the shots become increasingly full of shadows and menace, and Barry and Libby are forced into smaller and smaller spaces, symbolizing the world closing in on them. Deep Valley is based on a novel by Dan Totheroh. 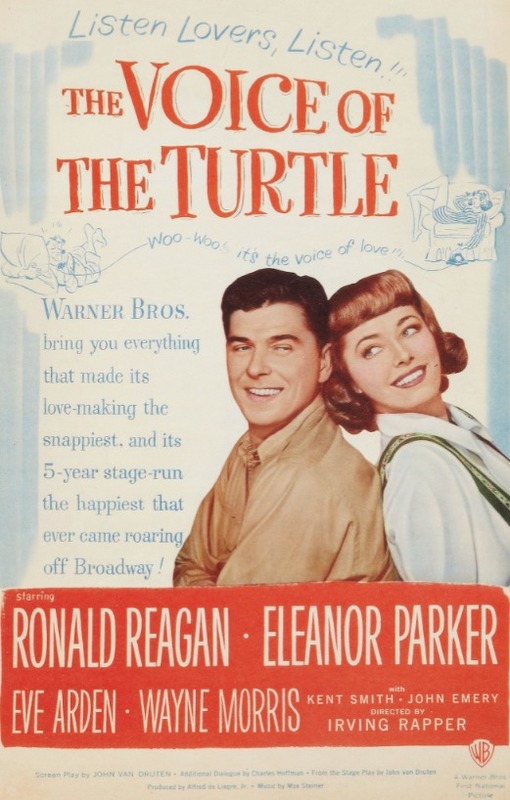 The screenplay is by Salka Viertel and Stephen Morehouse Avery, with uncredited assistance from William Faulkner. 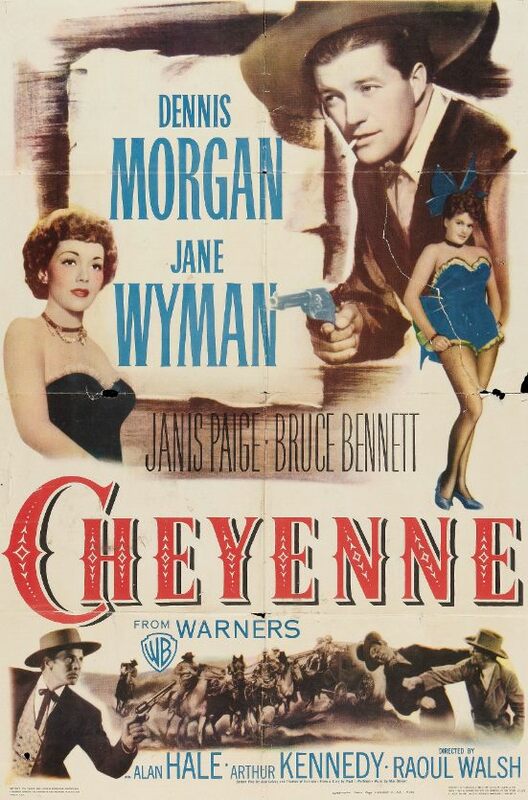 Posted in 1947, July 1947 and tagged Dane Clark, Drama, Fay Bainter, Henry Hull, Ida Lupino, Jean Negulesco, Romance, Warner Bros., Wayne Morris, Willard Robertson. Bookmark the permalink.